This case study is an exploration of how engaging in an artistic process might assist students with dyslexia in better conveying their ideas. The arts elicit higher-order thinking skills and utilize multi-sensory learning approaches, allowing students with dyslexia to experience the visual and tactile stimuli that create memories for them. For many of these students, artistic expression is their way to personally connect and interpret what they are learning by capitalizing on their strengths. Through a case study of two creative processes (one written and one visual), a series of individual interviews and a group discussion, the students and I explored the benefits art making has on their communication skills. The written and visual results, observations, interviews and group discussion responses were gathered, compared, and analyzed to provide an understanding of the benefits of an artistic process on the students’ ability to communicate their ideas. I relied on portraiture methodology to portray individual encounters, observations and perspectives. This study represents the students’ appreciation and awareness of the benefits art has in offering a different stimulus to improve communication skills in their learning. In addition, the awareness that artistic processes can benefit their communication in other modalities has given these students a potential strategy to enhance their writing abilities. ART CONNECTION 3 To Kaylin Rae who has always inspired m e with her never give up attitude thank you my friend and daughter. ART CONNECTION 4 ACKNOWLEDGEMENTS First and foremost, I want to thank my husband for being my rock, my sounding board and my top supporter. Without your backing, I would have flou ndered. To my dear friends Patty and Pat, your dedication to teaching dyslexic children is an inspiration to me. To Bev Wolf, who helped me begin this journey of exploration, you knowledge is unmatchable and invaluable. To Leslie Gates, thank you for your endless advice and encouragement. And lastly to all of the dyslexic children that I have worked with for the past fourteen years, thank you for your courage, creativity and insight into the world of dyslexia. ART CONNECTION 8 Abstract This case study is an exploration of how engaging in an artistic process might assist students with dyslexia in better conveying their ideas. The arts elicit higher order thinking skills and utilize multi sensor y learning approaches, allowing students with dyslexia to experience the visual and tactile stimuli that create memories for them. For many of these students artistic expression is their way to personally connect and interpret what they are learning by ca pitalizing on their strengths. Through a case study of two creative processes ( one written and one visual ) a series of individual interviews and a group discussion, the students and I explored the benefits art making has on their communication skills. T he written and visual results, observations, interview s and group discussion responses were gather ed compared, and analyzed to provide an understanding of the benefits of an artistic process on the students' ability to communicate their ideas. I relied on portraiture methodology to portray individual encounters, observations and perspectives. T his study represents the students appreciation and awareness of the benefits art has in offering a different stimulus to improve communication skills in their learn ing. In addition, th e awareness that artistic processes can benefit their communication in other modalities has given these students a potential strategy to enhance their writing abilities. ART CONNECTION 13 process and perceptions requires a level of confidence. The artistic process activates the mind to create, observe, evaluate and formulate opinions. Art might provide students with dyslexia with a means to find success by embracing the creative process and begin to believe in themselves, which in turn would give them security to take risks. If they could understand and tap into their artistic learning style with the knowledge that it may potentially assist their writing skills, they might consciously try ha rder, which in turn could produce more positive results. My research explored the possible connection and the potential benefit art making has on a dyslexic's education. My research question is what is the benefits of the artistic process on assisting stu dents with dyslexia in communicating their ideas? In essence, my study had two purposes: to explore the students' use of their visual skills, in order to determine if the artistic process alters their ability to express their ideas in writing, and to addre ss the gap in the literature relating to the relationship between dyslexia, art and written communication. ART CONNECTION 16 As an art teacher in a school specifically for students with dyslexia I have discovered that our popula tion tends to be very talented in the arts. Most are visual thinkers and often use images to process their ideas. A dyslexic child that has been encouraged to use his big picture thinking abilities intrinsically uses his unique view of the world to creativ ely express and gain personal experience. In examining the benefits of arts in the lives of children, the literature is unmistakably clear. Eisner (1986) says in his brief discussion of the imagination "the arts provide a platform for seeing things in ways other than they are normally seen" (p. 83). Arnheim (1980) classifies visual structuring into two groups, intuitive and intellectual. The intuitive process is achieved through perception, yet it is the intimate interaction between the intuitive and intell ectual functioning that yield the best results in learning. The arts encourage innovation, exploration and inquiry allowing children to look at the world in a more perceptual way. Smith (2001) believes the arts capture children's excitement, interests, and passions and that they are motivators demanding involvement. She also talks of the change of importance of art in school curriculum since 1980. She states more than half of the states are now required to include some art form for high school graduation. S he believes "the arts are important to all students, but for those (learning disabled students) whose educational lives are on the line, experiences in the arts are crucial" (p. 3). The arts facilitate higher abstract thinking skills, tapping into the big picture thinkers of dyslexic children. Silverman (1997) describes visual learners as those that think in images; they understand the big picture because the see the world through artists' eyes. For a dyslexic child, the arts are a means to find success in learning without the struggles faced with other academics. ART CONNECTION 17 According to Nachmanovitch (1989), when we create, we open up expressive possibilities. Eisner (2002) argued that students who participate in the arts learn shaping form to create expressive conten t and the ability to transform qualities of experience into speech and text. Smilan (2009) talks of the importance of leadership in art based creative inquiry and that these skills are essential for students to develop the skills such as interpreting, appl ying, and conceiving possibilities. Although research has illustrated the learning styles of dyslexic children and the benefits of visual thinking for any child, the potential link between art and dyslexia is weak. In The Dyslexic Advantage, Brock and Ei de (2011) explain how dyslexic brains differ from non dyslexic brains. They claim, "dyslexic individuals often struggle to retrieve words from memory" and that "many have difficulty in learning the rules that describe how words work together in groups" (p. 21 22). Shaywitz (1998) found that individuals with dyslexia use their right hemisphere more than others not diagnosed with dyslexia Arnheim (1980) discusses the sequence of learning for all students. He concludes that the child explores the world first through action, then through imagery, and finally through language. To understand language, perception and action play an important role. Hardiman (2003) argues that visual arts, drama, and movement activate the neurotransmitter serotonin, associated with high self esteem and enhanced cognitive skills. These authors talk of the importance of these styles and characteristics of learning, which are essential for a student with dyslexia to understand. Therefore, to combine self esteem, enhanced cognitive skill s and perception through the visual arts when looking for an encouraging language based outcome, it seems unlikely that a student with dyslexia would not benefit from this mix. ART CONNECTION 24 participated in this study, two have been enrolled at the school for four years, another for three years and one student has just completed her first year. I refer to those st udents as Elaine, Gary, Fred, and Mary, all of which are pseudonyms. These students were acutely aware of their diagnosis, their needs, their strengths and hopes for success. They brought their own experiences and opinions into this study that were conveye d throughout the interviews, discussion and my interpretation. The objective was to open a dialog on dyslexia and explore the benefits art making has on communicating their written ideas. Through a study of two creative processes, one written and one visu al, along with a semi open ended interview and group discussion, the students and I explored my research question. The student participants were eleven to twelve years of age. The students were asked to participate in a study but were not made aware of the intent up until the interview process. The written process consisted of roughly two twenty minute writing sessions. The students were asked to write a small descriptive paragraph, around fifty to one hundred words, comparing summer and winter. The studen t writings varied in size. These writings occurred both before and after they completed an art project based on the same topic. Both creative writings took place in the morning in their homeroom with their homeroom teacher directing them. 1 The art project was created in the morning in the art room. The students were given a choice of medium consisting of modeling clay, watercolor and acrylic paints, colored pencils and oil pastels to create their artwork. They had approximately fifty minutes to complete the ir project. The 1 The key to this case study was to conduct it without causing undue emotional distress to the students. I set the l ocation of the writing portion of the experiment to the student's homeroom where writing is more commonly expected than it is in the art room. This ensured their perception of the art room as a safe environment to explore and express. ART CONNECTION 27 their ability to generate and express ideas. This group discussion with all participants was the final portion of this study. ART CONNECTION 38 with pent up energy. His body and his mouth rarely take a break for a moment of silence. His non stop energy at times can stir others into a frenzy. Many times he is unaware of who is talking and continues to loudly talk over oth ers to get his thoughts out. Somewhat into the interview he told me that he has attention deficit disorder. I nodded; this information did not surprise me. The staff at my school, closely works together to share pertinent information that allows us to cons istently teach appropriately to each individual student. I asked him if writing was hard for him. "Yes," he replied, "it's the organization of the letters, the writing itself and of course the spelling. My verbal vocabulary is better than most of students my age, but I have no idea how to spell the words." He continued to explain that typing on the computer is much more bearable than writing and that he has been diagnosed with dysgraphia. Dysgraphia is a writing disorder that is associated with impaired han dwriting. Fred concluded that getting the letters to look right is one of his biggest struggles. When asked about the two writings he completed for this study, he stated the second writing was easier to think of descriptive words. He felt the art making pr ocess in between the two writings had helped him see the words visually. He continued to explain, "because I drew it and it gave me a better picture of the words." He enjoyed being able to talk to other people while working on his clay project. He does not consider himself to be good at art, although he is passionate about photography. When I asked him if he thought the photos that he takes are art, he answered, "I think of art as more of the sketching process of art." I asked him, "Are you creative?" With a smile, he instantly said "yes." ART CONNECTION 48 that the students' artwork would reveal detail relevant to the descriptive words in their second writing, which it did not. Nevertheless, after reviewing the interviews with the students, I feel that they believe the art making session was essential in assisting them to communicate ideas in written words. In every interview, each student stated in several answers that by seeing the visual or pictures, they were better able to understand what they were attempting to communicate. Furthermore, their discovery of the potential relevance of the artistic process in communicating ideas is the first step needed for them to full y grasp the possible significance this artistic process has to offer as a potential strategy to lessen their disability. ART CONNECTION 53 confidence in themselves. Art can be this p assion for many of them if they embrace their dyslexia and the creative strengths that come with it allowing them to discover their potential, their motivation and pride. I return to my question what can educators do with this information? And how does it affect the methods of teaching dyslexic children? It is well known in the educational field of dyslexia that a teaching method that includes explicit, systematic, sequential, repetitious instruction is most successful in teaching children with dyslexia Be rninger & Wolf (2009) state s all children with dyslexia need specific, intense, structured, sequential, language based instruction. Art in most school settings is considered an enhancement of curriculum not an essential part of it. If beyond this study, st udents with dyslexia do indeed believe that art making assists in communicating their ideas, that knowledge could restructure the methods of teaching; It would offer another technique in teaching children with dyslexia throughout all classrooms advancing a rt as a vital component to curriculum. In moving forward in thought, future research might consider conducting a longer case study with a larger pool of participants. My study was drawn from a small group of participants in a short period of time. Drawin g on a greater amount of students would present a wider variety of learning styles. Also, conducting a longer study that allows for multiple settings for an extended time of the visual and writing processes might lead to an enhanced understanding from the students, which in turn could potentially guide them to active practice in their studies. ART CONNECTION 54 APPENDIX Interview Questions 1. How do you think you learn best? 2. Is writing hard for you? Why or why not? 3. How do you feel when you write? 4. Did you enjoy the wri ting portion? Why or why not? 5. When using the prompt, was it hard to think of descriptive words? a. On the first writing? Why or why not? b. On the second writing? Why or why not? c. Was there anything that felt different between the two writings? 6. Do you think a t ime limit makes a difference in your writing? Why or why not? 7. How do you feel when you create art? 8. Did you enjoy the art making portion? Why or why not? 9. When thinking of the prompt, was it hard to create your project? 10. Do you think the art making helped you express your ideas better? Why or why not? ART CONNECTION 55 REFERENCES Armstrong, T. (1987). In their own way. Los Angeles: Jeremy P. Tarcher. Amburgy, P. (2011, Sept). Diversity, pedagogy, and visual culture. Art Education, The Journal of the national art education as sociation, 64 (5), 6 11. Arnheim, R. (1980). A plea for visual thinking. Chicago Journals 6(3), 489 497. Berninger, V., & Wolf, B. (2009). Teaching students with dyslexia and dysgraphia. Baltimore: Paul. H. Brooks Publishing Co. Bransford, J., Brown, A., & Cocking, R. (Eds.) (2000). How people learn: Brain, mind, experience and school. Washington, DC: National Academy Press. Burrows, D., & Wolf, B. (1983). Creativity and the Dyslexic Child: A classroom view. Annals of Dyslexia, 33 269 274. Campbell, L. (1992). Teaching and learning through multiple intelligences: The visual arts, art as an instructional tool Seattle: New Horizons For Learning. Chapman, T. K., (2007). Interrogating classroom relationships and events: Using portraiture and critical rac e theory in education research. Educational Researcher, 36 (3), 156 162. doi:10.3102.0013189x0730143 Cravath, J. L. (2002). A humanities based classroom: One teacher's motivations for integrating arts and humanities. ProQuest Dissertations and Theses; Pro Quest Dissertations & theses (PQDT) Davis, R. D., & Braun, E. M. (1994). The gift of dyslexia. New York: Penguin Group. De Burgh, J. (2000, October). Dyslexia and inspiration: The art of Michelle Molyneux, The Lancet 356(9240) 15321 doi:10.1016/S0140 6 736(05)73286 4 Dewey, J. (1989). Art as experience. New York: Berkley. ART CONNECTION 56 Dewey, J. (2001). Child and the curriculum. New York: Dover (original published in 1902). Edwards, B. (1999). The new drawing on the right side of the brain New York: Penguin Putnam Inc Eglinton, K. A. (2008). Using participatory visual ethnography to explore young people's use of visual material culture in place and space. In R. Hickman (Ed. ), Research in Art and Design Education Issues and Exemplars, (pp.51 66). Chicago: intellec t Bristol. Eide, B. L., & Eide, F.F. (2011). The dyslexic advantage. New York: Hudson Street Press. Eisner, E. (1999, Jan/Feb). Does experience in the arts boost academic achievement? The Clearing House, 72 (3), 143 149. Eisner, E. (2002). The arts and th e creation of mind. New Haven & London: Yale University Press. English, F. W. (2000) A critical appraisal of Sara Lawrence Lightfoot's portraiture as a method of educational research. Educational Researcher, 29 (7), 21 26. Freedman, K. (2004a). Becoming a researcher in art education: Developing research skills. Studies in Art Education 45 (3), 187 189. Freedman, K. (2004b). Becoming a researcher in art education: Forming research questions. Studies in Art Education 45 (2), 99. Gardner, H. (2004). Fra mes of mind: The theory of multiple intelligences. New York: Basic Books. (Original work published 1983). ART CONNECTION 58 from http://www.inclusion.com/artportraiture.html Pierson, J. M. (1999). Transforming engagement in literacy instruction : The role of student genuine interest and ability. Annals of dyslexia, 49. Saracho, O.N., & Spodek, B. (2003). Contemporary perspectives on early childhood curriculum. Charlotte: Information Age Publishing. Scheman, N. (2008). Epistemology resuscitat ed: Objectivity as trustworthiness. In A.Jaggar (Ed. ), Just Methods: An Interdisciplinary Feminist Reader (pp. 401 413). Boulder, CO: Paradigm Publishers. Shaywitz, S. (1998). Functional disruption in the organization of the brain for reading in dyslexi a. 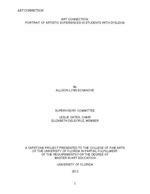 Proceedings of the National Academy of Sciences, USA, 95, 2636 51. Silverman, L. (2002). Upside down brilliance, The visual spatial learner. Denver: DeLeon Publishing Inc. Smilan, C., & Miraglia, K.M. (2009, November). Art teachers as leaders of auth entic art integration. Art Education. 62(6), 39 45. Smith, S. (1990). Succeeding against the odds. New York: The Putnam Publishing Group. Stewart, M. G., & Walker, S. R. (2005). Rethinking curriculum in art Worcester: Davis Publications Inc. Vail, P (1990a). About dyslexia: Unraveling the myth Rosemont: Modern Learning Press. Vail, P. (1990b). Gifts, talents, and the dyslexic: Wellsprings, springboards, and finding foley's rocks. Annals of Dyslexia, 40, 3 17. ART CONNECTION 60 BIOGRAPHICAL SKETCH Allison Lynn Echanove was born in Boise, Idaho on July 21, 1960. She lived in Boise with her family where she received her elementary and secondary education In 1979 she moved to Moscow, Idaho where she attended the University of Idaho, ultimately graduating in 1983 with a Bachelor of Fine Arts Degree. She moved to Seattle, Washington with her husband and daughter in 1990. She began work on her Degree of M asters of Art Education in 2010 while teaching art at a private school for children with dyslexia in the metropolitan area of Seattle. Her masters research explores the role art has in assisting children with dyslexia in expressing their written language. Working as an art teacher in a school geared specifically to meeting the needs of these children, Allison understand the benefits art has to offer those children in emotional and social growth. As the art teacher, she coordinates the annual Arts Festival and Auction Class projects each year. She is a member of the National Art Education Association and the International Dyslexia Association. In January of 2011 her article Art: A Means to Success was published in Washington Branch of the International Dysle xia Association newsletter. In her free time Allison enjoys painting oil landscapes. She continues to show her work in the Seattle area.